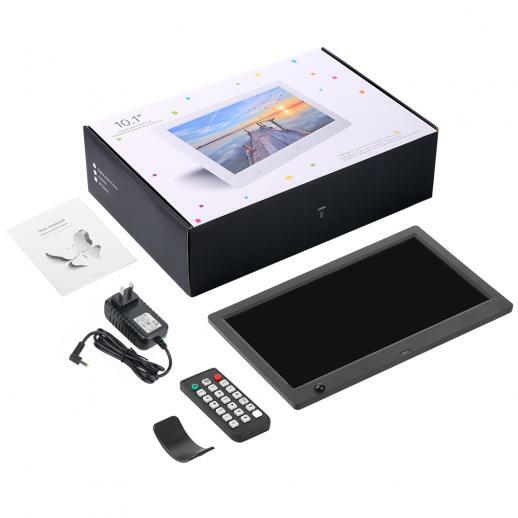 Buy K&F Concept 10inch digital photo frame hd led videos 1024*600 16:9 with motion sensor, mp3/calendar/clock/e-book us plug online, worldwide free shipping and 30 days return guarantee. 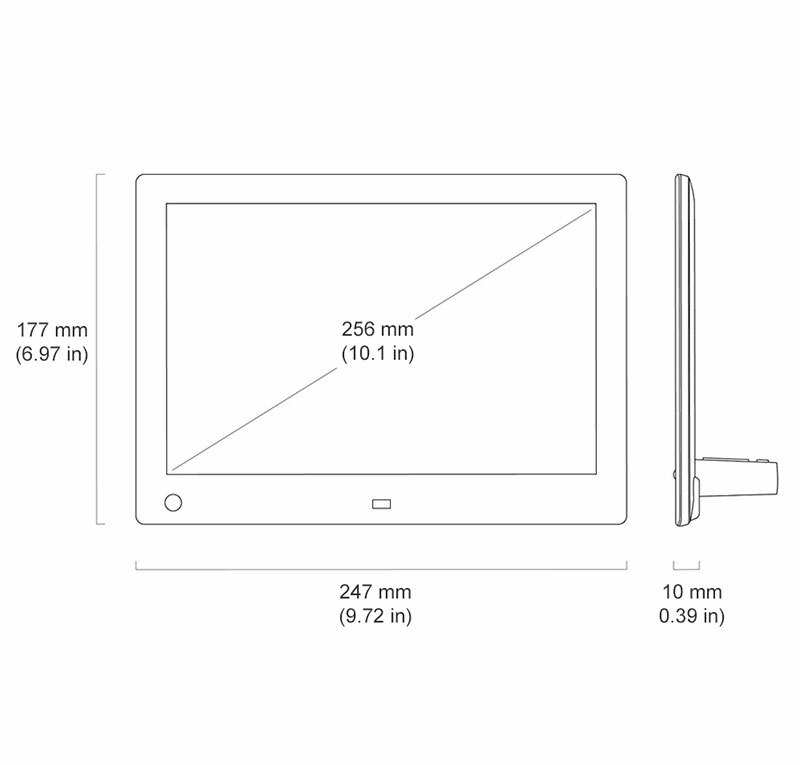 • 1024*600 high-resolution IPS (16:9) screen offers a clear and distinct display. 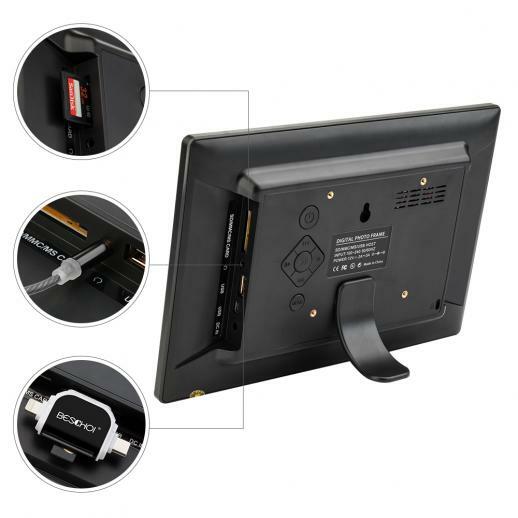 Supports 720p and partial 1080p HD video playback. • Designed with energy-saving motion sensor, it will go on or off automatically when you enter or leave the room wihout consuming too much power. The motion sensor distance is 3M/9.8ft. 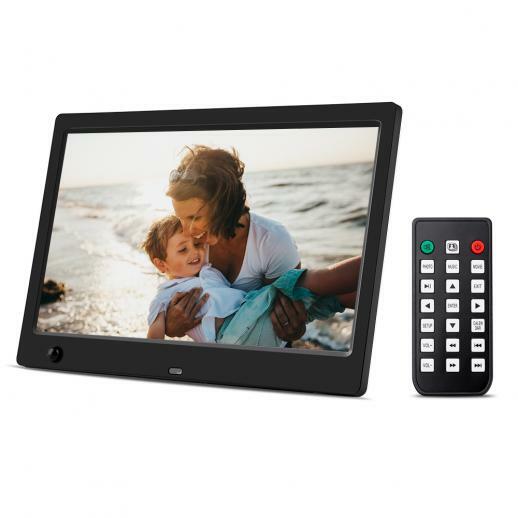 • Coming with a wireless remote control, hand free and much more convenience to viewing your favorite pictures or videos and listening to your favorite tunes. 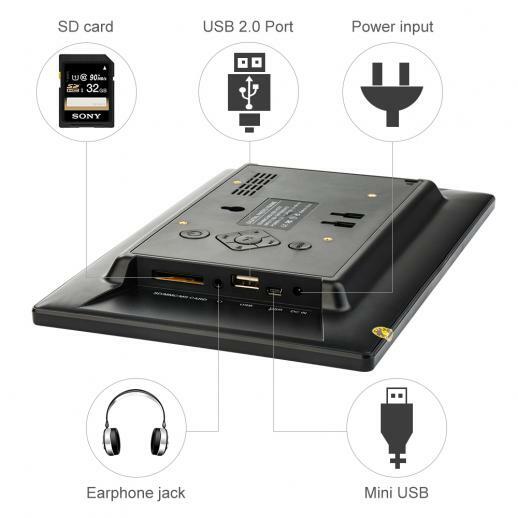 • Interface supports USB 2.0; U disk; SD/SDHC(Max 32G). 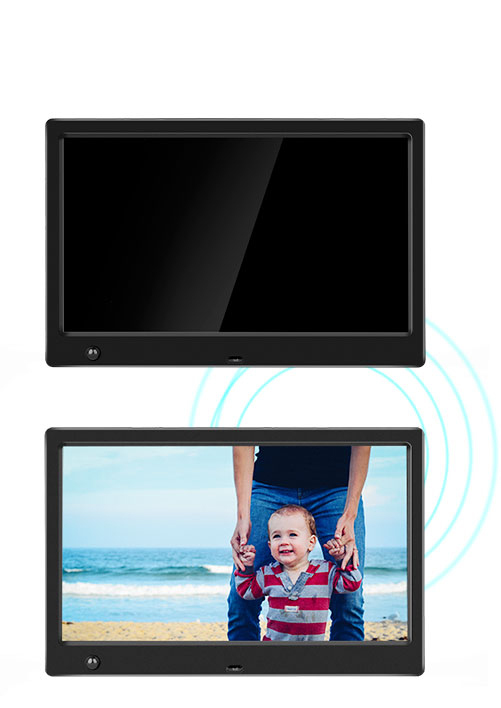 Plug and play to instantly display all your digital photos and videoes, simple to operate. 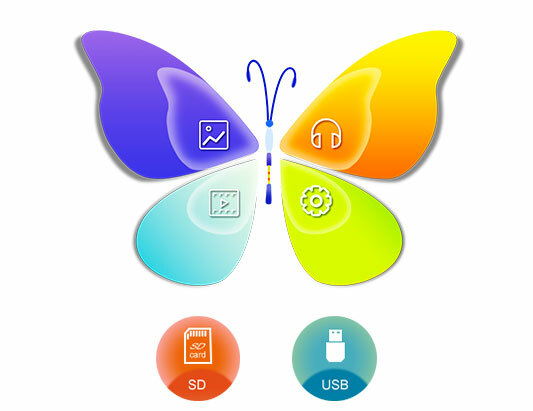 • Support Music, Photo, Video, Calendar, Clock & Alarm,E-book, File Management, ect, making it more than just a frame. 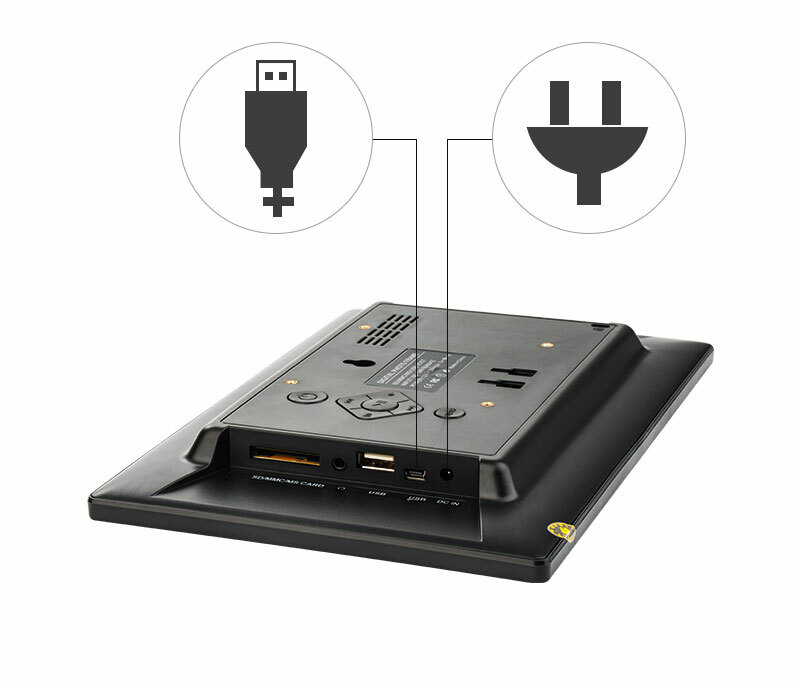 Interface supports USB 2.0; U disk; SD/SDHC(Max 32G). 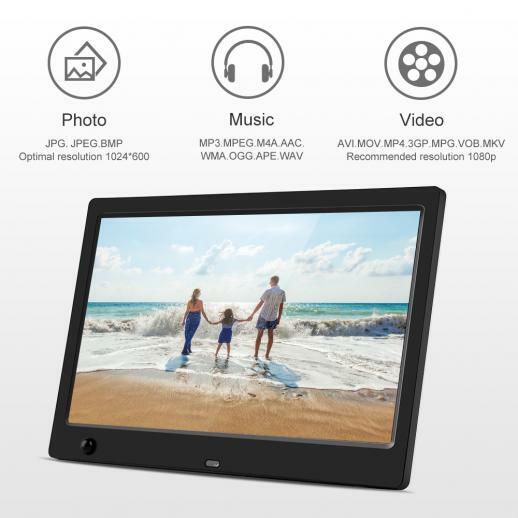 Plug and play to instantly display all your digital photos and videoes, simple to operate. 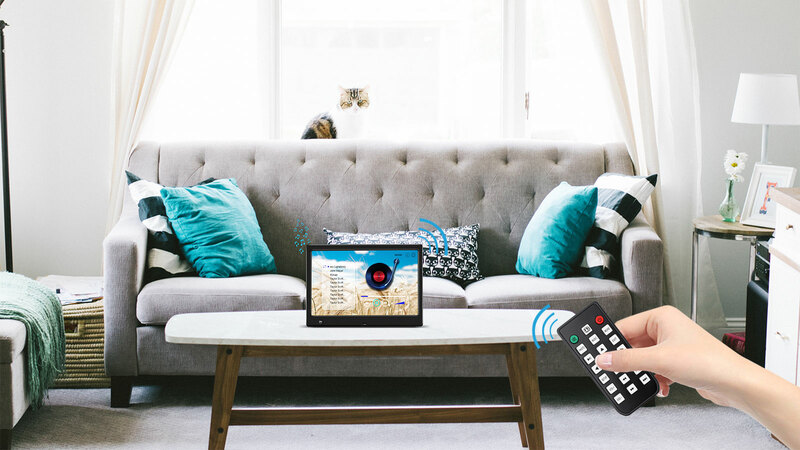 Coming with a wireless remote control, hand free and much more convenience to viewing your favorite pictures or videos and listening to your favorite tunes. 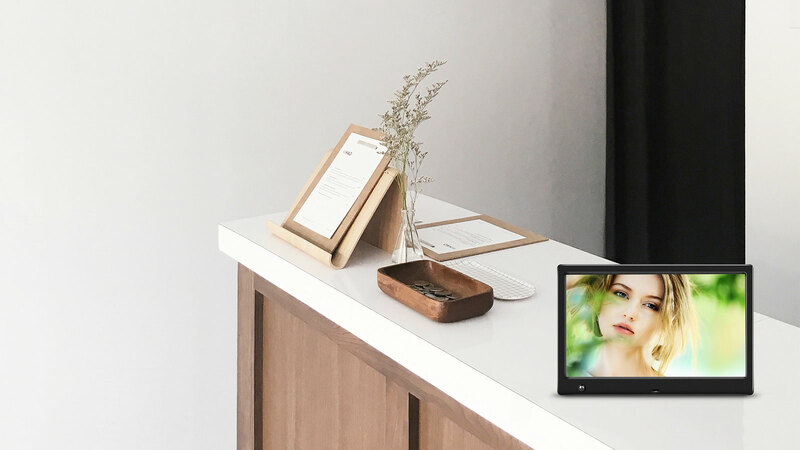 Support Music, Photo, Video, Calendar, Clock & Alarm,E-book, File Management, ect, making it more than just a frame. 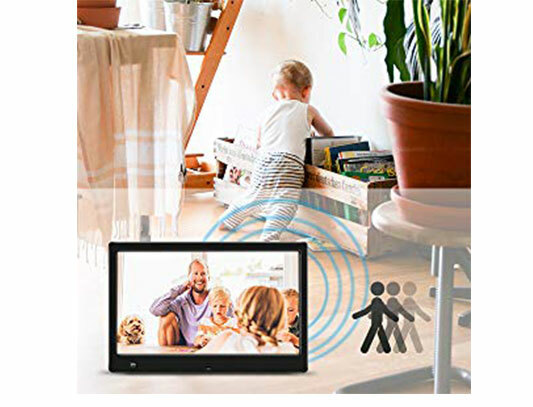 Smart Motion Sensor ① The factory setting of motion Induction function is default opened,when you entered the area of 3M/9.8 ft front of the digital photo frame,The equipment will sense the video which stopped before.The photo & MP3 Stereo and Calendar can be restored immediately. ③ Time, 30sec, 1min, 3min, 5min, 15min, 30min, 1hour, it's will automatic shut-down, Both power saving and safety to give you a perfect and humane experience. 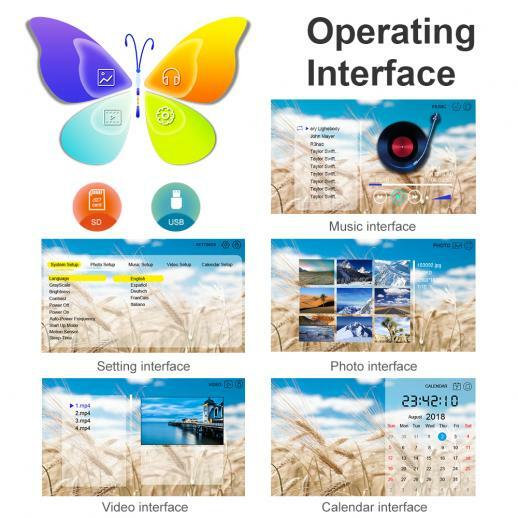 Clock&Calendar Function ① Clock&Calendar Function make it more convenient for your life. ② Time setting:Year/ Moth /Day/ Hour/ Time format setting/Alarm setting. ③ Support Language: English/ Spanish/ Italian/ Germany/ French/ Chinese. 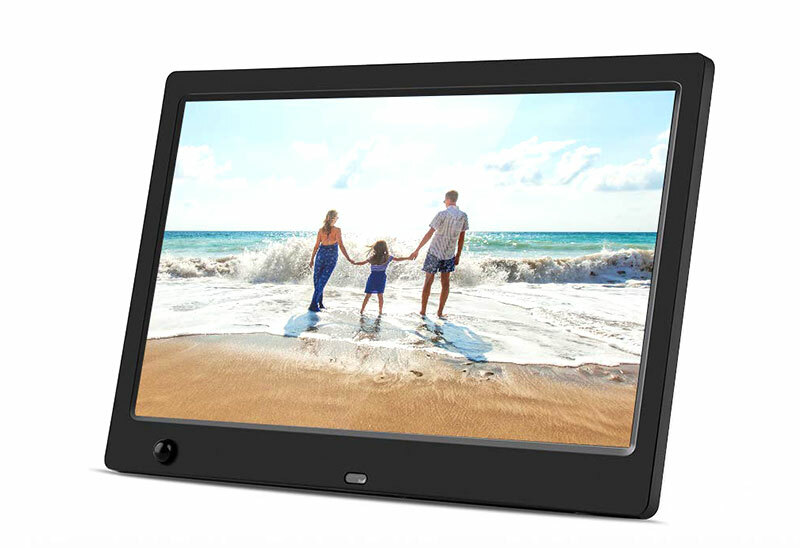 Auto-rotate & Random Display ① This digital photo frame will adjust your photos' orientation automatically and display your photo in original size、equal scale or full screen mode. 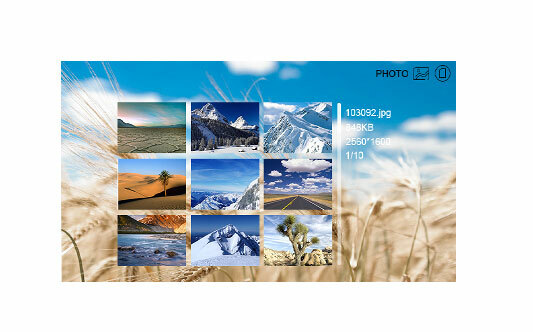 Display photos from SD cards can up to 32GB. 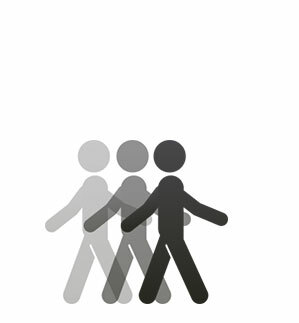 As many as 10,000 photos can be shown in a continuous slideshow in random or sequential mode. ② Multiple File Types Suported. 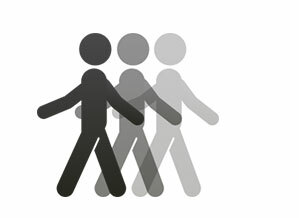 ③ Photos: JPG/JPEG/GIF (Ideal resolution for photos is 1024*600 pixels) . 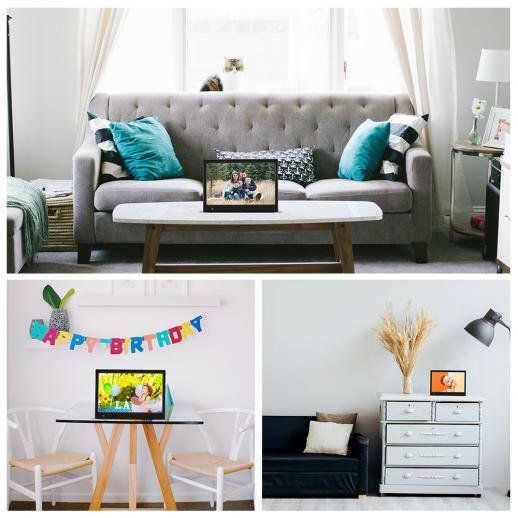 This frame is perfect for everyone - from professionals, to parents and grandparents. They all deserve a frame that works and lets them enjoy most precious and cherished moments. 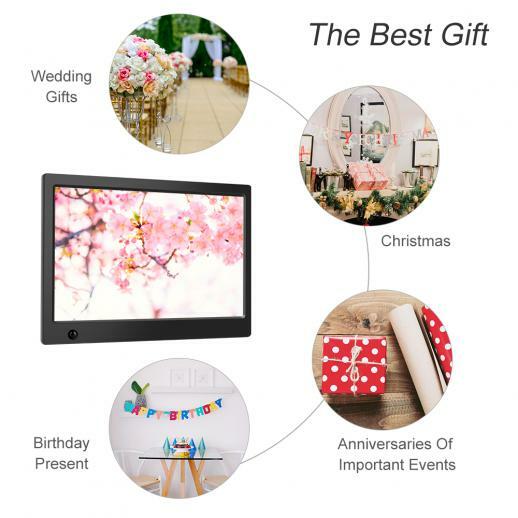 This digital frame is a great gift for birthday, family reunion, festival like Halloween or Christma. 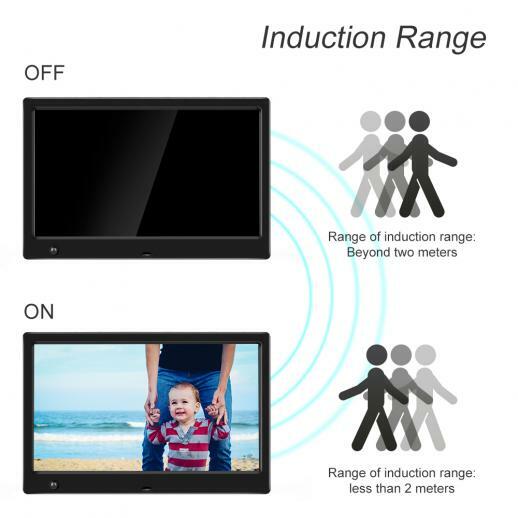 It will go on or off automatically when you enter or leave the room wihout consuming too much power. To begin with, I really liked this frame, it fits perfectly into the interior of our living room. 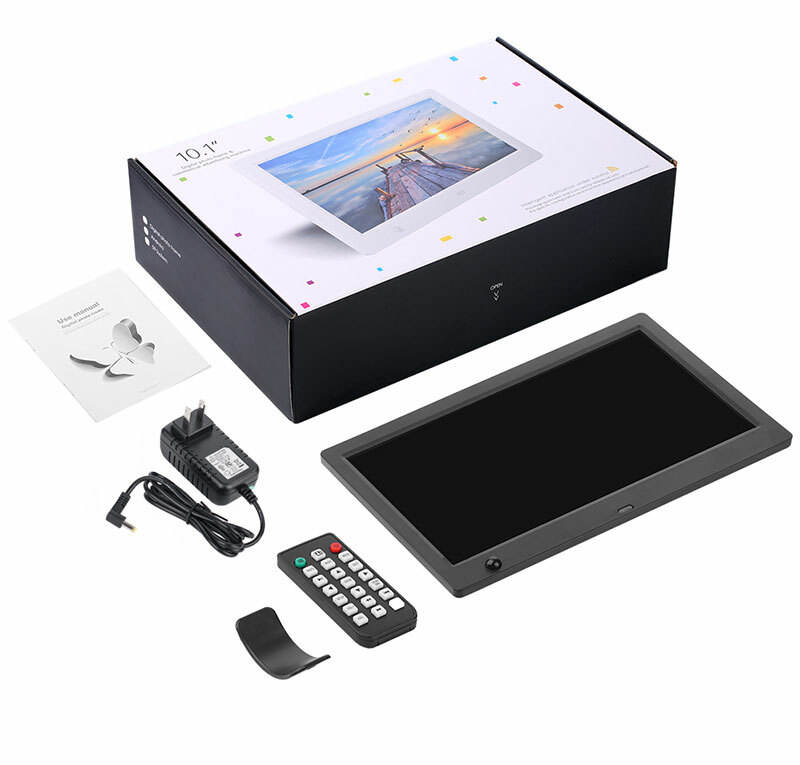 It is very easy to use with a distinctive, high-quality display and excellent quality images and videos. It seems to me that this is a universal gift for any holiday, my girl is already thinking to order the same birthday of her best friend. Excellent purchase, I recommend, because not so often you can find a frame with such a high-quality display for such a low price. The frame is made of very high quality materials! As a father, I can tell you that I am delighted with this picture frame.All I had to do was insert the SD card and the images loaded in seconds. We love looking at our pictures as they rotate throughout the day. The screen is really responsive and the streaming is great. 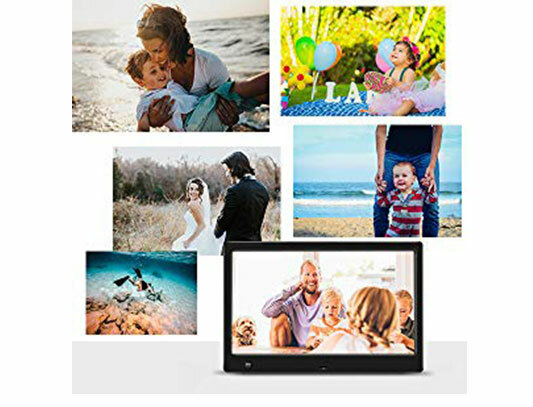 My wife also likes this frame, it is very easy for us to use the digital photo and video quality frame and it looks very well, this picture frame amazing! Very good deal! Like this product. Gave it to my mother as a gift and she liked the gift! It was so easy to download the pictures on a memory card so all she had to do was plug it in and turn it on!! 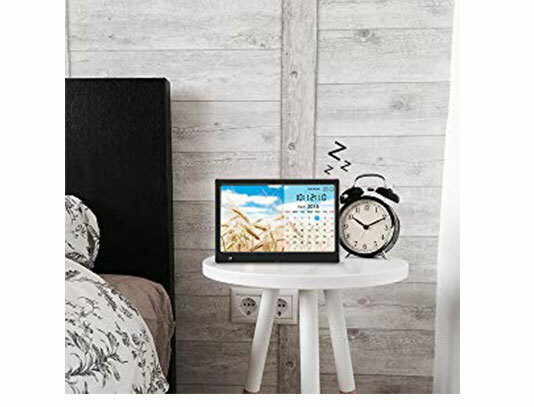 It is really cool device and good decor for your home! I'm really impressed from the digital photo frame capabilities.I placed it next to my senior mother and she understood how to operate it very fast.We use it normally for pictures slideshow and from time to time to play videos and music.The other functions such as: clock and timers will be handy soonThis was the perfect frame for our newly renovated bedroom. It looks modern and sleek. 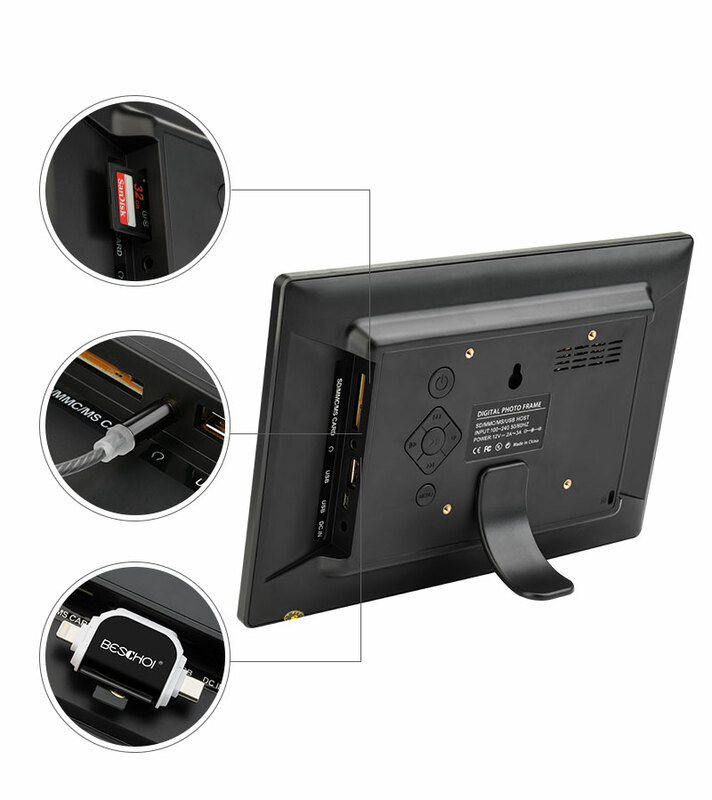 It’s not overly big but the screen is big enough to see the images clearly from far. I love the fact that it has more then one use unlike previous models. I use it as a clock interface during the day. I have not installed it on the the wall but rather kept it on top of a bookshelf. 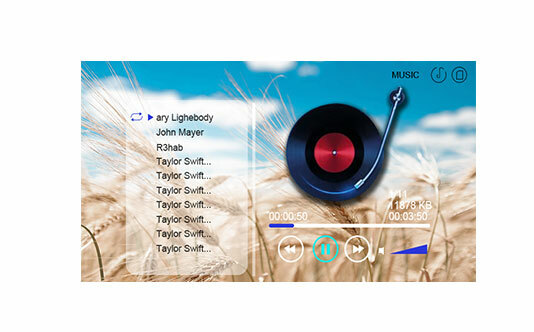 It’s very user friendly and was setup in a few minutes. Overall I am a very happy customer. 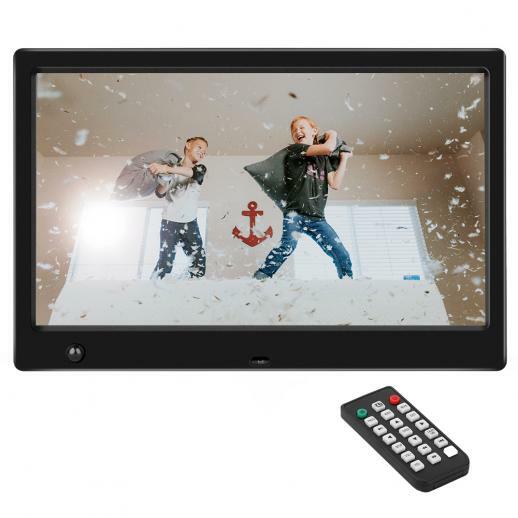 The frame is a good size and the picture quality is good also. Pictures loaded automatically from my SD card (no trouble at all).Getting the frame to boot directly to picture slideshow and disabling the motion sensor took some tinkering with the settings.